I have also done a ton on German Garden since I last posted a picture, but apparently my little camera “forgot” that I took a picture of it. Our old point and shoot camera still works, but has developed some severe dementia since Nathaniel was born. It will randomly have memory card errors or delete pictures that you have taken. Oh well…for the moment it is still a bit easier than using the fancy new camera when I am trying to upload to my laptop until we figure out why I can’t access photos on our network. Well, I hope everyone is having a fantastic week. I am off to upload pictures to build a photo album for Allen’s grandparents and then maybe work on a motif for Alchemical Romance. Yippee! Spot of Tea looks wonderful. Makes me want to brew me a spot. 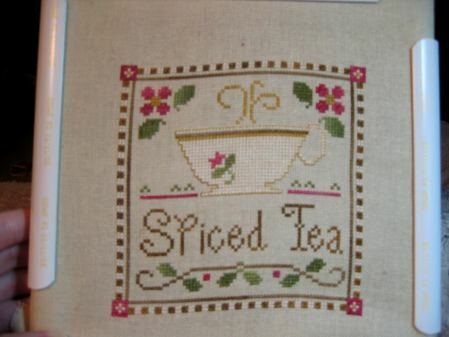 Spiced Tea is so cute! Oh this is pretty. It’ll look lovely hanging in your breakfast nook. Lovely! Hmmm I’d be upset if my camera was loosing pictures and would get that new one figured out real soon! Just lovely! A Beautiful finish! Your Spiced Tea turned out really well. Can’t wait to see the rest of the series … sounds like a great thing to put in your breakfast nook! Spot of Tea looks really great. Lucky you getting all that time to stitch, it’s always great when someone can look after the little ones and give you a little break to yourself. That is pretty. I look forward to seeing rest of series. CONGRATS ON THE FINISH IT LOOKS GREAT! What a lovely finish, Leslie. I think they will look great all together. That’s really pretty Leslie. Oh, if only I hadn’t gone back on the wagon! (LOL) These designs are so apt for me! Very belated congratulations, too, on the birth of Nathaniel. I love the coffee and tea threadpacks – so pretty! Congrats on the finish!